Today's Veterans Day and yesterday was the 235th anniversary of the U.S. Marine Corps, so we're remembering those who served and continue to serve by highlighting their awesomest transportation. Our readers helped us identify the ten greatest Marine Corps vehicles. What&apos;s Your Favorite Marine Corps Vehicle? Get Some: This is a bit surprising, but Marines ride motorcycles. The Hayes Diversified Technologies M1030M1 uses a diesel inside a modified Kawasaki KLR650 frame. The motorcycle tops out at 90 mph and can get 96 miles per gallon at 55 mph. It was supposed to go into production for civilian use and sold as the Bulldog four and a half years ago. However, it was delayed indefinitely because of high military demand. Get Some: The AAV-7A1 is the current water-to-land transport for the Marines, having the ability to be used for amphibious and inland operations. Weaponry consists of a 40 mm automatic grenade launcher, a 25 mm chain-fed autocannon in the form of the M242 Bushmaster, and a M2HB .50-caliber machine gun. It's powered by a 400 Cummins VT diesel engine, but the RAM/RS variant has a VTAC 525 that produces, you guessed it, 525 HP. Marines call the AAV the amtrack, a portmanteau of amphibious tractor. Get Some: The Super Stallion is one of the largest and heaviest helicopters in the U.S. military, weighing in at hefty 16.6 tons. The Super Stallion is basically a Sea Stallion but with a third engine, making it even more powerful. Those 3 engines are GE T64 turboshafts producing 4380 shaft HP each (13,180 SHP total!). Max speed is 196 mph, with a 173 mph cruising speed and a range of 540 nautical miles. You can bet it's heavily armed, with 3 .50-caliber machine guns, and seating for up to 55 troops. The Hurricane Maker will soon be replaced by the in-development CH-53K which has new engines, composite rotor blades, and a larger cabin. Get Some: The MTVR is a six-wheel drive all terrain vehicle. It is called the 7-Ton to designate the MTVR's off-road cargo capacity. It is mostly used to move the Marine Corps' M777 howitzer, fuel and other equipment. The 7-Ton also has a Central Tire Inflation system, allowing the operator to inflate the tires to the pressure necessary for the given operation. Get Some: The FPI Cougar is part of the MRAP, or Mine Resistant Ambush Protected, family of armored vehicles designed to protect from IEDs and ambushes. This V-shaped monocoque helps to direct blasts away from the vehicle to keep it from exploding. The 330 HP Caterpillar I6 diesel will propel the Cougar to 65 mph. There have been zero Marine deaths in over 300 IED attacks on Cougars, which has led to larger numbers of the Cougar being ordered. Get Some: The M1 is named after General Creighton Abrams, the Vietnam era's Army Chief of Staff and Commander of military forces. This is the Marines' primary battle tank, as well as the Army's, and is anticipated to be in use until 2050. The M1 is heavily armed and well protected and has been used if the Gulf War, Afghanistan, and the Iraq War. It is powered by a Honeywell multi-fuel turbine that produces 1500 shaft HP, meaning that this 63 ton behemoth can reach a top speed of 42 mph. One of the tank's greatest achievement was during the Iraq war where seven T-72 Lion of Babylon tanks were destroyed at point-blank 18 miles south of Baghdad. No Americans were lost. Get Some: The AH-1 is the Marines' main attack helicopter. It is powered by two GE turboshafts producing 1690 shaft HP each. The upgraded AH-1Z Viper, which was just released in September, produces 200 more shaft HP and includes a variety of improved components and systems. During Desert Storm, the AH-1W destroyed 97 tanks, 104 armored personal carriers, and two anti-aircraft artillery sites. The light attack helicopter was also used in the rescue of Captain Scott O'Grady, whose F-16 was shot down Behind Enemy Lines. Get Some: The Harrier is a second generation Vertical/short takeoff and landing (VSTOL) fighter jet. It was developed with the help of our mates in the UK. It is powered by a single Rolls-Royce Pegasus turbofan that produces 23,500 pounds of thrust. The engine has quite a unique design. There are two intakes, visible at the front of the plane, and four synchronized vectorable nozzles, two cold ones at the front and two hot ones at the rear. There are also several valved nozzles around the plane, allowing it to be control at low speed and facilitating vertical takeoffs. However, the Harrier had an extremely high accident rate, 3 times that of the F/A-18 Hornet, and came to be called the widow maker. Get Some: Probably one of the most recognizable military vehicles, the Humvee even made it to civilian production. There are at least 17 variations on the Humvee used in the military and are used for transporting troops, serve as ambulances or as support vehicles. The Humvee was not meant to be used as an attack vehicle, but modifications were made during the Iraq War to armor the vehicle and protect troops from IEDs and ballistics. This armor wasn't initially made available to troops and Marines often had to improvise to create "hillbilly armor" or "farmer armor". Due to the Humvee's vulnerabilities and high loss rate, it is no longer being purchased and will be replaced by the Oshkosh MATV and the MRAP. Get Some: Take a helicopter and mix in some turboprop airplane and you get the V-22 Osprey. 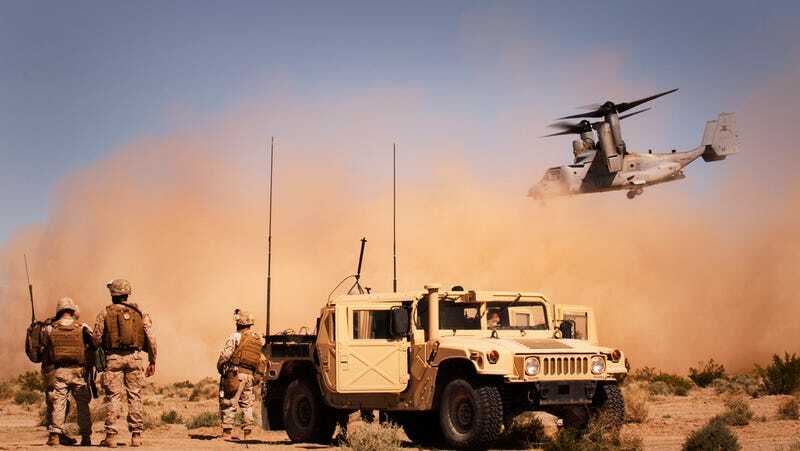 The V-22, like the Harrier, is a VSTOL vehicle. It is able to take off vertically with the help of tiltrotor engines, which are either vertical or horizontal depending on use. It can carry up to 32 troops and 20,000 pounds of cargo. It is powered by two Rolls-Royce Allison T406 turboshafts, producing 6150 shaft HP each and cruises at 277 mph at altitude. The V-22 became the replacement for many of the older helicopters, such as the CH-46 Sea Knight, in use by the Marines. It was used in the Iraq War and Afghanistan and served in the Haiti relief effort, which was the aircraft's first humanitarian mission.